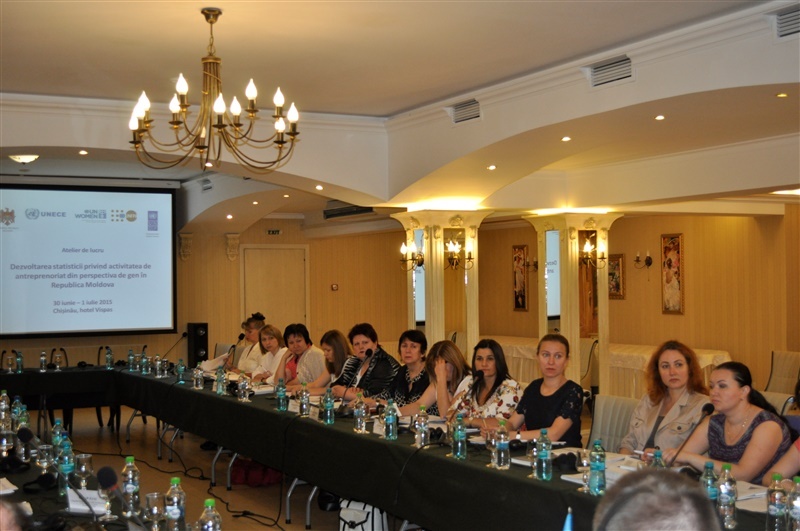 Representatives of Moldovan ministries, holders of administrative data sources, academia and civil society responded to the invitation of statisticians and gathered on 30 June-1 July 2015 within a workshop on developing entrepreneurship statistics from gender perspective in the Republic of Moldova. The workshop aimed to discuss ways of data collection to measure entrepreneurship by gender. Also, the use of "women entrepreneurship" concept within the national strategic framework, so as for statistical purpose, was discussed. 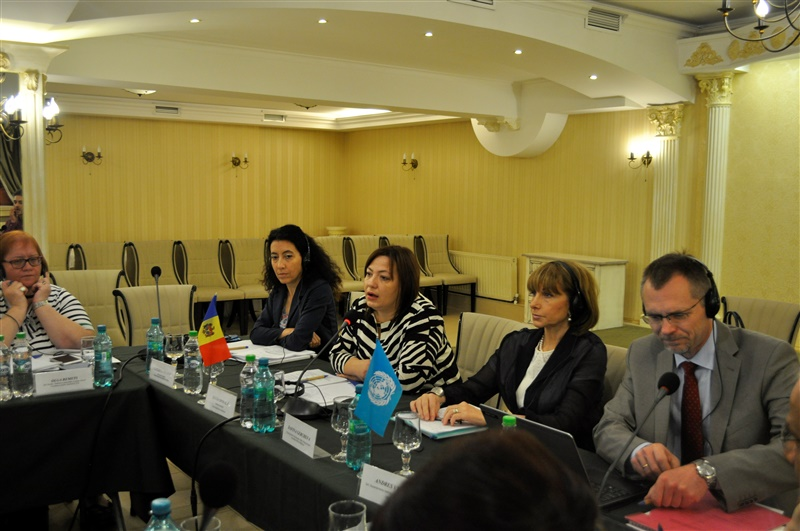 The general director of the National Bureau of Statistics (NBS) of Moldova, Lucia Spoiala, said: „Gender mainstreaming into national statistics is on our ongoing agenda and is one of our concerns. In 2009, we undertook a survey, which represented the very first national exercise on obtaining statistical information regarding the participation of women and men into business activity. Further on, we need to focus on developing new statistical indicators aligned to international standards and to responding to the actual needs of data users, as well as for comparability with international datasets”. “This event provides excellent opportunity for statistical experts from national authorities to build new capacities for data production and to contribute to "localization" of Sustainable Development Goals, and feed the national development frameworks with reliable, timely and internationally comparable data on entrepreneur activity in the Republic of Moldova,” stated Dafina Gercheva, the UN Resident Coordinator and UNDP Resident Representative. Andres Vikat, Chief of Social and Demographic Statistics, United Nations Economic Commission for Europe (UNECE), mentioned: "Such capacity development events, that supplement national vision of statisticians, policy-makers and civil society with international expertise, prove to be very effective for the development of gender statistics at the national level also because they reflect the perspectives of both data producers and users". In 2015, Republic of Moldova will participate in testing of the module on measurement of the entrepreneurship in households from gender perspective. The exercise is supported by UNECE and UN Statistical Division (UNSD). In paralel, the methodology for data collection on women and men entrepreneurship within the business statistics will be developed, and the full use of administrative sources available in the country will be made. The event was organized by United Nations Development Programme (UNDP) in the framework of the United Nations Joint Project on Strengthening the National Statistical System, in cooperation the United Nations Economic Commission for Europe (UNECE), so as the Project “Interregional cooperation to strengthen national capacities to measure progress in achieving gender equality and women’s empowerment”, with the financial support of UN Women, United Nations Development Account and United Nations Population Fund (UNFPA). For information purpose: Since 2014 the gender statistics section is available in the Statistical Data Bank of Moldova, including the indicators grouped per domains of use and aligned with the minimum set of gender statistics indicators recommended by the UN Statistical Commission. In 2015, aiming to further improve the gender statistics through its harmonization to international requirements, NBS, in collaboration with UNECE and the UN Joint Project on Strengthening the National Statistical System, willconduct more activities on improvement the gender sensitive statistics availability, as well as training of users to apply gender statistics for policy-making.